When the weather gets hot so does the topwater bite. What many anglers don't think about is how to fish a topwater lure from a kayak. Not all boats and applications of the techniques are the same. 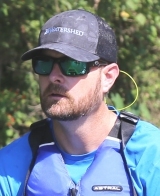 Kayak anglers will deal with hookset issues, leverage issues, and kayak movement issues. Don't fear! There are ways to correct those problems that happen when fishing topwater baits from a kayak. When you are standing on a big power boat deck you have lots of leverage to set a hook. When you are sitting in a kayak seat you reduce that leverage at least by half. In a kayak, it's nearly impossible to use your legs to bury a hook in a bass that has slurped a frog and you need that leverage to bury the hook so you can wrangle the fish from the lily pads or grass mats. The first thought that might come to mind is a sidearm hookset. The problem with that is it will often result in missed fish because it changes the angle to pull the bait out of the side of the mouth. What you really want is a top of the mouth hookset. To get that, position your kayak parallel with the stretch of grass or pads you will be fishing. If at all possible, sit sideways in the kayak, also called side saddle, to where your legs are dangling over the side, or at least toes pointed to where you will be casting. When you make a cast, make sure you cast straight in front of you. Keep the slack out of your line as you work it back as much as possible and your rod tip high. When you see a fish take your bait, reel in any slack while lowering your rod tip to the water and as you feel the fish, raise the tip fast while gripping the rod tightly. A loose grip on a rod while setting the hook, especially on a topwater bite, can mean a rod and reel are going swimming. If you are having trouble landing the fish, you might also try a trailer hook to increase hookups. Extra Tip: Rod floats can help avoid loss if a rod and reel go for a swim. If the wind is blowing even a measly three knots, the chances are your kayak will be moving as well. As the wind increases, so does the distance the kayak will move. It can be hard to really work over a spot with a big grass bed or lily pads as you zoom past because of the wind. You could combat that by hiding in creeks all day that are sheltered from the wind but the fish may or may not be there. Several others ways to combat kayak movement exist. Anchors are a great way to stay in one place. The types of anchors vary but a universal formula that I use is whatever the depth I am fishing, I need to let out three times that amount of line for the kayak to stay in place. I could explain the physics but will save that for another time. To help position the kayak you can install an anchor trolley. A trolley utilizes a ring on a pulley system to adjust the anchoring point on your kayak. This will allow you to position the kayak facing upwind, downwind, or at a cross wind angle. If anchors aren't really your thing you could also look at a stake out pole. Many companies make these and some people even make their own. A prefer ones that float and are two feet longer than the depth I normally fish at. Typically I'll setup in six feet of water so I utilize an eight foot pole. You can attach these to the kayak by a rope or if you installed an anchor trolley they can go right through the ring. Extra Tip: Carrying a knife will allow you to cut the anchor rope if you get hung up and can get free. Hopefully these tips will help you land a few more fish this Summer and keep your kayak from moving faster than you want it to. Topwater fishing in a kayak can have issues, but with these solutions you'll have more time fishing and less time fighting frustration.